File folder indexes mark the spot, increasing your profits through better file organization. File folder indexes are sturdy dividers with colored Mylar-coated tabs that are hole-punched for fasteners. 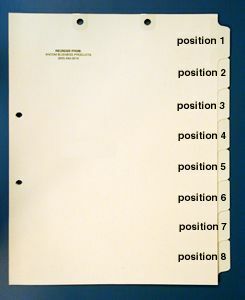 Divider tabs are imprinted with document titles, and filebacks have fasteners for piggybacking sections. Stock file folder indexes, sold individually or in sets, are perfect for medical charts. Need a custom filing solution? Indexes installed? Ancom custom indexes are made just for you. Design your own indexes and get a free quote, or try self-adhesive chart divider tabs. Free samples available. Write-on/Type on Stock Index. Manila. Position 7. 50 per pkg. For more information on this product, call 800-845-9010 or email request@ancom-filing.com.